Business is strong for many companies…but will it last? Complex sales pipelines are increasingly elongated, forecasting is inaccurate, and deals are stagnating – all despite growing investment in sales training and marketing technology. Senior executive teams sense that while things are OK now, they’re not sure which sales and marketing levers to pull to accelerate and sustain growth, or when and how to pull those levers. They’re right to worry. The solution is simple, but hard. It’s about shifting their mindset from the inside looking out, to a more customer-centric point of view. Successful companies will replace selling TO customers with buyer empathy which enables them to understand and adapt to the changes in the B2B buyer journey and complex sales. Content marketing or digital advertising aren’t enough. Neither is technology, nor is social media. Yet, despite a profusion of books that offer tactical tips for successfully implementing digital sales and marketing, few resources exist to help senior executives associate buyer-driven disruption with necessary organizational change and playbooks for success. The cycle of confusion perpetuates itself, as companies continue to invest in the latest “MarTech” and sales training without realizing desired outcomes. In Common Sense Revenue Growth authors John McTique and Ed Marsh provide the strategic context, the organizational roadmap and an execution framework to help CEOs and executive leadership teams build a revenue growth organization that is responsive to the key factor that will determine success – meeting or exceeding buyer expectations. Published by Riptide Business Press, Common Sense Revenue Growth moves readers quickly through understanding evolving buying behaviors and sales methodologies. It explores the key organizational changes that will enable some companies to outperform over the next decade, and it tackles the role of technology with an independent perspective. If you’ve ever wanted to review proposed budgets and investments with the assurance of knowing what will work for complex B2B sales in tomorrow’s markets, this book is for you. It will help you design and implement a revenue growth structure that embraces changing buyer habits and expectations. 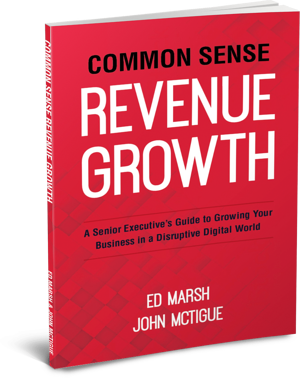 Common Sense Revenue Growth is available in printed and ereader editions at Amazon.com. The audiobook version will be released later in 2018. About John McTigue: John has 34 years of experience in energy and industrial sales and marketing, and he recently retired from co-ownership of Kuno Creative, an award-winning inbound marketing agency and Diamond level HubSpot Partner. A graduate of Yale University and holding an MS in Geophysics from the University of Arizona, John has a keen interest in technology, enterprise sales and marketing and disruption in B2B revenue growth.